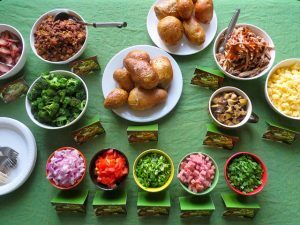 7/13 Thursday Night Dinner will feature a Baked Potato bar! Dinner will be at 6:15 pm. The cost will be $2 per potato. RSVP by Wednesday night, to help ensure we purchase enough potatoes. Pay at the snack bar on Thursday evening. Butter, sour cream & salt/pepper will be provided. Please help add to the “bar” by bringing a topping for potatoes. Please RSVP through this quick form to let us know you’ll be there. Here are a few suggestions for toppings!